Okay, so I know there are some pastors who use sports analogies ad nauseam (I’ve been known to make reference to the New Orleans Saints often), but permit me to make one more as I reflect on Christmas Eve. You see, Christmas Eve for pastors is like the Super Bowl for football coaches. There are two times each year when all the preparation, anticipation and expectation are heightened for pastors and church staff–Easter Sunday and Christmas Eve. At least it’s that way for most United Methodists. I suppose I could say if Christmas Eve is the Super Bowl, then Easter Sunday would be game seven of the World Series. To watch our 6 p.m., Christmas Eve worship service, click here! Easter Sunday and Christmas Eve are the two largest attendance days in our church year. 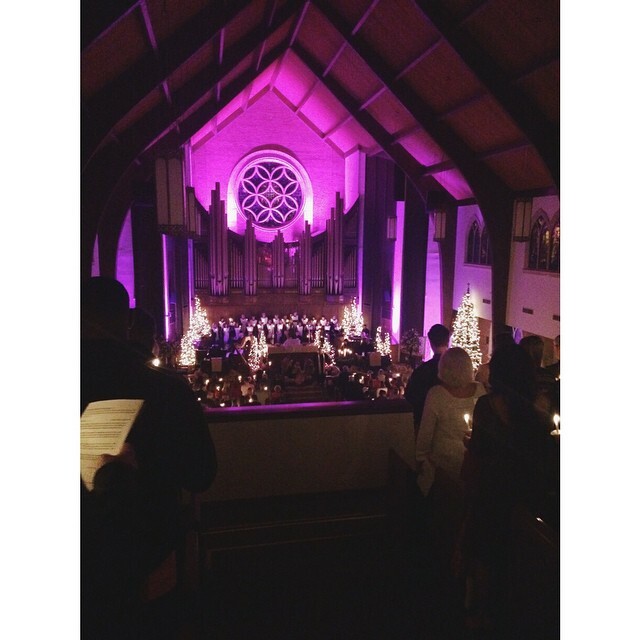 For years, I didn’t have a Christmas Eve service in the small churches I pastored. It wasn’t a tradition I grew up with, so when I entered ministry, I didn’t have a model to base a service on, so I never pushed the issue. I must confess when I went to seminary, the student appointment I served did have the tradition of Christmas Eve worship, but I nixed it in favor of returning to Louisiana to be with family (we were homesick–don’t judge me!). But, when I returned to Louisiana permanently, we moved to Morgan City, and Christmas Eve was THE worship service that everything pointed toward. There was no way I was touching that one! It was my first experience with Christmas Eve worship, and it was wonderful (and yes, it was the largest attendance of the year–even larger than Easter). Planning for Christmas Eve actually begins in the spring as I do sermon planning for the last half of the year. I suppose that’s one of the big differences in a pastor and a football coach. A football coach makes draft choices, prepares games plans, and goes through training camp all in the HOPE the team makes it to the playoffs, and if the team makes it to the playoffs, then game plans, defensive schemes and line ups are made based on the opponent in the HOPE the team wins the game and advances. Football coaches HOPE to make it to the Super Bowl, and usually have two weeks to prepare. Pastors KNOW Christmas Eve is coming. It’s not a matter of if we’ll make it to the Super Bowl. The Super Bowl is coming. We know the date. We know we’ll be in the game. We know there’ll be a crowd. We only HOPE we’ll be ready. And, there’s no way we could prepare in two weeks. What are some of the plans that have to be made? Hmmm? First, is the sermon. Yeah, I know. Most people come to Christmas Eve for the candlelight and Silent Night, so does it really matter what the preacher says? Why not just give a nice little homily about babies and starry nights…say something sweet about God’s love, and light the candles. It’ll be okay. I’m sorry! I just can’t do that! This is the most people I’ll speak to at one time all year long. I can’t not share the Gospel. I can’t not make it evangelistic in some way. I can’t not tell them why Christmas matters. It does matter what I (or any preacher) say, so it’s important that planning happens, and it starts for me usually in March or April. What’s more, it’s got to be a short sermon, and I don’t know about other pastors, but it takes more time to write a short sermon than a long one. There’s plenty to say, it’s knowing what not to say that’s so hard. Next, is music planning, and it’s not just selecting the music. It’s rehearsing the choir. It’s chasing down and lining up orchestra members. Yes, it’s even finding money to pay orchestra members. All that starts early in the year, too, because rehearsal usually starts in September. I just thank God for music ministers who handle this endeavor. I guess I could compare a good music minister to an offensive coordinator. There’s consultation between the head coach and the coordinator, but it’s really the coordinator’s job to put the offensive game plan in motion. Trust me! Music is like going on offense. It will set the tone for the service. Music matters. Music matters a lot. It’s not just a matter of singing Silent Night. Silent Night may the be crescendo, or the exclamation point, but everything must build up to that point in the worship. Then, there are the visuals. Ours were spectacular this Christmas Eve (thank you, Kem Alexander!). The sanctuary of First United Methodist Church literally glowed with colorful lights this year. It was beautiful, but that, too, took planning, coordination and lots of hard work. There are poinsettias to be ordered. There are trees to be erected and decorated. In our case, there’s a stage to be put in, furniture to be moved, and an altar to be raised. It’s a lot of work. It begins weeks in advance. Finally, there are tons of logistical issues to be worked out as the “big game” approaches. There are ushers to organize (in our case, ushers for three different services), communion servers to organize (again, for three different services), clean up staff between services to coordinate, and I’m sure I’m forgetting the minute details that our facilities staff coordinates of which I have no idea. That’s why it matters when you have a coach assembles a great staff. The staff knows their roles and the coach can depend on them to carry out their role. I have a great staff! I thank God for my staff. If I’m any good at all, it’s because they are better than me. Of course, I’ve always tried to have people around me who are a thousand times better at what they do than I am. I’ve achieved that. Though there are many similarities, there are also some differences. For one, the Super Bowl is one game. For FUMC, MONROE, Christmas Eve is three services (4 p.m., 6 p.m. and 11 p.m.), so we have to be “on” our game three times. Another difference? In the grand scheme of things, the Super Bowl doesn’t really matter. In ten years, or twenty years, or a hundred years, the teams victory will be nothing more than blip on the radar of history. But, sharing the Gospel with someone on Christmas Eve who might not otherwise ever attend worship could have an eternal impact, and that’s a major difference, indeed. Oh, and there’s one other difference I can think of–the winner of the Super Bowl usually goes to Disney World. Pastors and church staff just want to go home and go to sleep. While many coaches, players and fans have a few months to savor their victory, pastors and church staff only have a few days. After all, Easter is right around the corner. I’ve probably overplayed the Super Bowl analogy. Some may even think it blasphemous to compare the two, and perhaps they would be correct, but I know the hard work and effort that goes into Christmas Eve. There may be a better comparison, but I’m not sure what it is. Perhaps it would be better to make no comparison at all. I started a “tradition” in 2003 of writing an annual letter to send to friends and family to catch them up on the happenings of the Malone family. Not that anyone cared about the happenings of the Malone family, but a letter seemed an easier (and less expensive) method of staying in touch with friends from churches we served, and with family that we rarely ever saw, than purchasing tons of cards, writing a personal note in each one, and getting them in the mail. So, 2014 will mark the 12th letter in the series, and the web and Facebook have made connecting with friends and family old and new easier than ever before. I’m posting the annual letter on my blog, I’ll link it to Facebook, and there’ll be a link on Twitter. All that kind of makes mailing the letter seem a little archaic, but we’ll mail as many as we ever do (actually, a few more–we add a few more each year), only those we mail will be later (you’ll probably get them after Christmas–it has something to do with four funerals in a week, preparations for three Christmas Eve worship services, and the lack of color ink for the printer). So, read it now…or, wait for the print edition…or, don’t read it. The choice, as always, is yours! One more year behind. It doesn’t seem quite possible that an entire year has passed since I last wrote. I must confess this has been the fastest year of my life. I’ve blinked and it’s gone. 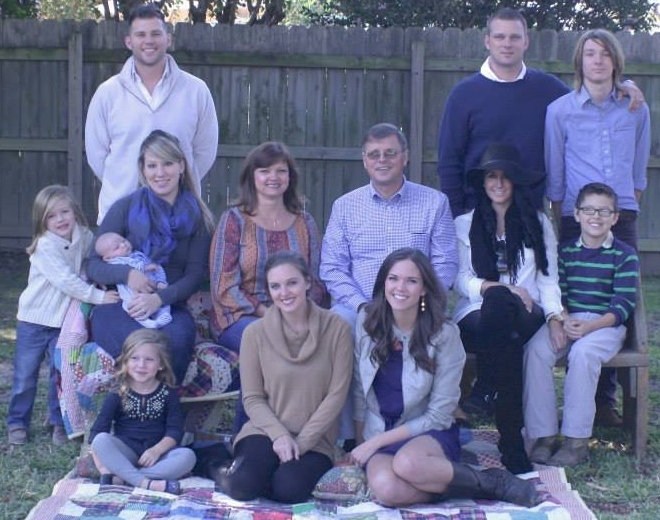 I’ve blinked and the children are bigger (grandchildren, I mean—I suppose “older” might be a better word). I’ve blinked and my hair is a little grayer (at least it turned gray and not loose). I’m not sure how much news there is to report this year, and I’m so late writing that this is more apt to be a New Year’s update rather than a Christmas update. I’ve just been too busy to sit down and write, and when I’ve not been busy, I’ve simply been too tired. Yes, I know. “You’re a pastor. You only work one day a week!” Yes, but that one day is a killer. Takes a whole week to recover! Where should I begin? Vanessa and I have completed another year at First UMC, Monroe. It’s been a great year, too. We still enjoy spending as much time as we can on our back porch, especially by the fire pit, and Vanessa is enjoying spending as much time as possible being grandma. She travels every Thursday to Minden to keep Josh’s three—that’s right, three—but I’ll share more about that in a moment. One thing I’ve even considered is that with Facebook, this annual letter is becoming a little obsolete. Want to know what’s happening with the Malone Family? Just log on to Facebook. We post way too much stuff on there. So, here’s the skinny on the Malone Family for 2014. Adam is at home in West Monroe with Felicia and their two boys, Kade (15) and Kobyn (11). Both the boys are quite musical, and we hope they continue to hone those talents in the future. They are all very active at FUMC, Monroe, and that’s a blessing, too. Also, Adam is now a professional writer. He writes a regular article at www.whodatdish.com. It’s all about the New Orleans Saints, a passion he and I both enjoy, so I’ve had fun reading his musings. He continues working for Noble Drilling Corporation, and is headed for Australia (probably by the time you receive this letter). Josh and Piper’s big news, of course, is the birth of their third child at the end of September. Skyler Augustus Malone was born on September 29th. Mom and Dad call him Skyler (well, everyone else, too), but Poppy prefers to call him Gus-Gus. We’ll see how long he (or they) let me get away with that. Of course, the twins (Peyton and Ryder) have already taken Skyler under their wing and are teaching him all their mischievous ways. We’ll see where that leads. Brittney and Kelsey are living at home now. Kelsey graduated from LA Tech University (Go Dawgs—we’re now a three Dawg family) in May, is exploring permanent, long-term (at least, that’s what Dad hopes) employment options, and continues to play the keyboard for our contemporary worship service as well as for J-Force, our children’s choir. Brittney will be moving to Bossier City in January. She’s taken a new position as manager at Hooter’s in Bossier City. She’s commuting from Monroe right now (send money, please), but will have her apartment beginning January 1. We’re happy for her. It’s the job she’s wanted for a long time. We’re glad it finally came to fruition. That about catches everyone up on the happenings of the Malone Family for 2014. Seriously, just check Facebook. You’ll learn more than you ever wanted to know. We love you all. Merry Christmas and Happy New Year!